Barlborough is a village in the district of Bolsover, county of Derbyshire, formerly Barleburg, 'Fort by Boar Wood' and is documented in the 1086 Domesday Book. The village is rich in interesting buildings including the Church of St James the Greater, the Old Hall, the impressive Village Cross and the ornate Memorial Arch. The village is within easy reach of the National Rail Network, the Trans Pennine Cycle Trail and local airports. Hospitality and dining are catered for by the many hostelries, hotels, bed & breakfasts, restaurants and fast food outlets. 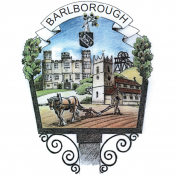 Barlborough is a popular destination for visitors, particularly walkers. Situated on Junction 30 of the M1.